Advances in research facility design and construction focus on maximizing the functional life of the research spaces, allowing for the most flexibility in configurations of laboratory spaces, and the ability to expand or contract research programs without sacrificing functionality of the spaces. Emphasizing flexibility, these facilities provide opportunities for new research team leaders to customize their labs to their specifications without rework that may affect cost or schedule. Gilbane understands the relationship of different laboratory module configurations with required building ventilation systems, casework and lab services delivery methods and how each can impact building operations and facilitate research activities. To deliver the highest quality, compliant facilities, Gilbane utilizes BIM and intensive trade contractor coordination to ensure precision. 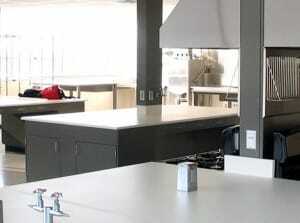 Additionally, high-end interior finishes for this facility type are common. Where required, our team will create mockups to review functions, aesthetics, materials and fabrications to establish early quality benchmarks. Research facilities typically consume greater amounts of energy than other building types and Gilbane’s advancement of sustainable building strategies has greatly benefited life-cycle costs and operations costs of research buildings. The operational benefits of installing efficient building components like chilled beams (to reduce energy consumption and maintain building performance) can result in savings to offset other project costs.